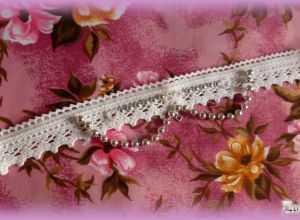 White-biege choker tuned in steampunk mode made from cotton lace. Decorated by bronze chains, cog-wheel and wide bronze shaped bat pendant. In lower part is also pendant in shape of bow-knot. 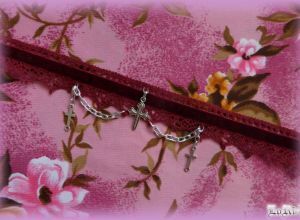 Closing in back is also made with bronze chain and lobster clasp. 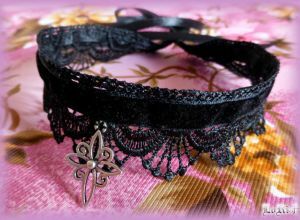 Black choker tuned in steampunk mode made from cotton lace. Decorated by bronze chains, cog-wheel and wide bronze shaped bat pendant. In lower part is also pendant in shape of bow-knot. Closing in back is also made with bronze chain and lobster clasp. 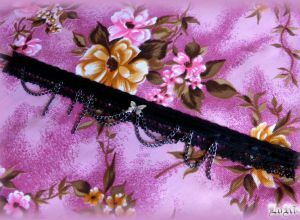 Shiny sparkling choker tuned in winter style. It has rich decoration with metallic and plastic decoration in shapes of snowflakes and stars - all of that on velvet-satin base. 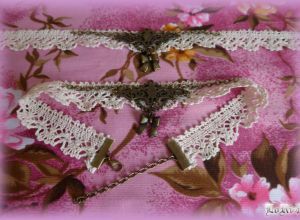 Choker in burgundy-red contains cotton lace, velvet and satin ribbons, and silver-metal decorations. Suitable for classic or gothic style. 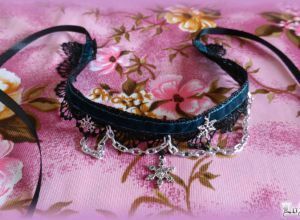 Choker in black an jade combination - very suitable for the winter season. The wide lace from rayon and twined satin ribbon set to lacing are completed with pretty jade green velvet ribbon. The decorations are made from tripple pendants in shape of snowflakes and metal chain - all tuned in silver colors. 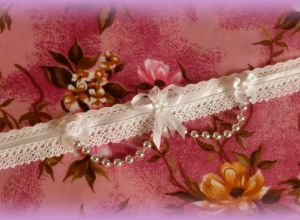 Beautiful choker in combination of white an pink. Made as gift specially for bride on her big day. 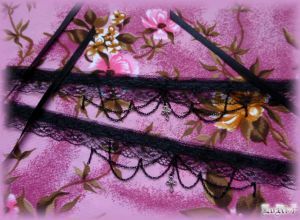 The third edition of neck accessory in burgundy and black combination, made of cotton lace and satin ribbons. The whole complete two rows of tiny metallic chains and little decoration in the heart shape. 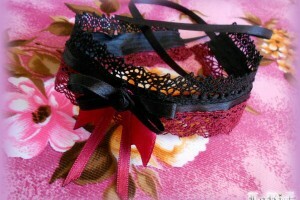 Choker in black and burgundy combination, made ​​of dual black satin ribbon and burgundy ribbons. 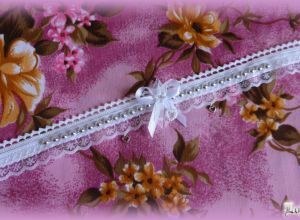 Tiny chain and artificial beads decorate the main broad cotton laces in double color variations. 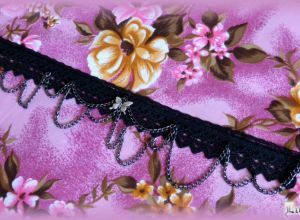 Wine red and black choker, decorated in the same combinations. Made and given as a gift at special occasion of the official opening of retail shop Porcelain Doll. 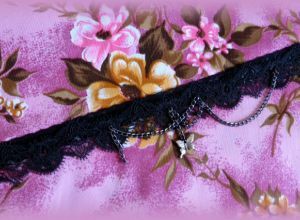 Black choker made ​​of simple black satin ribbon and cotton lace. 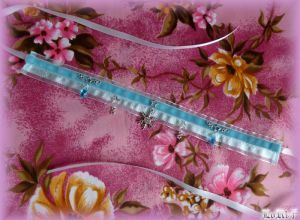 It Is decorated with handmade flower application.